Chewy loves to lay on paper. She curls up on the desk wherever the biggest pile is. Yesterday she hit the jackpot! I am surprised it took her so long to find it. As you can tell by the glare she is giving me, she was not impressed I woke her for a photo shoot. This is Kona, a very shaggy golden doodle (I’m not sure what you call golden doodles that aren’t gold…). 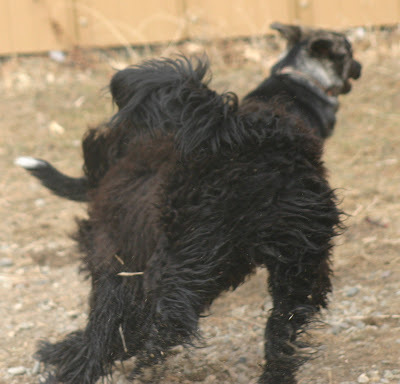 He races around his fur just flies in all directions. We haven’t managed to get a stationary picture yet. Since we opened the daycare in August, we’ve had a few dogs “break a nail”. We’ve never been able to figure out what they are breaking their nails on. The dog never cries out so we don’t know it has happened until we see blood. 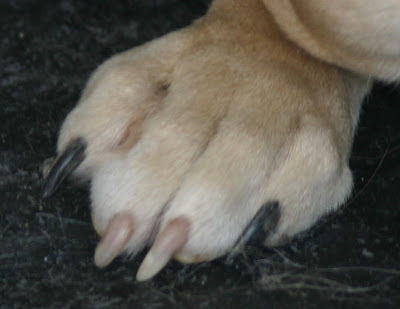 A dog’s nail is constructed of a hard outer cover, which protects the quick. The quick is the inner soft part containing blood vessels and nerve endings. If the hard outer core breaks (or is cut too short) to expose the quick, they will bleed. 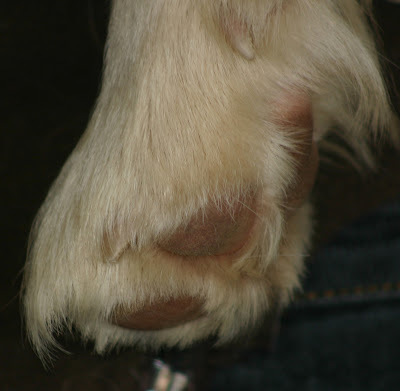 While we can’t figure out for sure how dogs are breaking their nails, we are starting to see a pattern in the length of the nails – they tend to be on the longer side. We think the longer nails might be getting caught on something, possibly the chain-link fencing. Some dogs are more prone to it than others (i.e. if it happens once in their life, odds are it will happen again) but you can help reduce the occurances if you keep your dog’s nails nice and short. How do you know if your dog’s nails are too long? An easy way to tell is if you can hear them clicking on the floor. If you are unsure, you can always just ask. This is a good length for your dog’s nails to be. If you aren’t sure how to cut your dog’s nails, Amanda would be more than happy to give you a quick tutorial or we can cut them here for you for $10. Some regular daycare dogs have a standing order to get their nails cut once a month, during one of their daycare visits. If you are interested in this, just let us know and we can schedule them in. 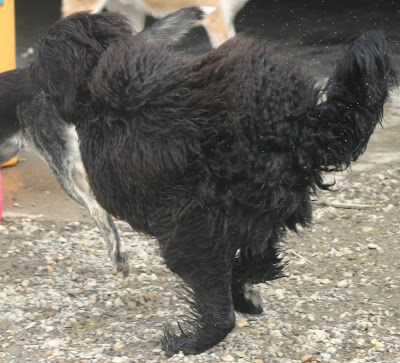 Well we’ve got one Saturday left (March 1)for the Indoor Dog Park. It has been a lot of fun. We’ve met lots of new pups and best of all, lots of new people too! It is nice to be able to chat while the pups play. We’ve had some requests to keep it open longer but we will be opening Saturdays as the “regular” daycare (i.e. You drop your dog off while you go shopping, run errands, or have a day of fun in the mountains). We’ve thought about moving the indoor dog park to Sundays until April but it isn’t going to work – we’ve rented the building out for a few Sundays and it would just be too inconsistent. Sorry! So the daycare is going to open on Saturdays starting March 15. The hours will be from 8 a.m. – 5 p.m. If you need a shuttle on Saturdays, you must book it by Thursday. Sandy will be working most Saturdays with Amanda and I filling in when she is unavailable. I hope to start (or continue!) to see you on Saturdays! I’ll leave you with a cute picture of Perkins – just so the post isn’t picture free! A few months ago we had the pleasure of doing some puppy visits for a litter of lab pups. I know, I know…we have hard jobs. Well today, we got to see one of the pups “all grown up”! She has quite a few months of growing still to do but she is much more grown up than the last time we saw her. Lili is easily the bravest puppy we’ve ever had at the daycare. 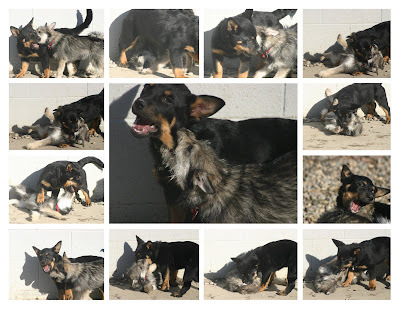 She was in with all the big dogs within an hour of arrival and by the end of the day was wrestling and playing with the grown-ups. She must take after her mom. Check out Ruby the Rocket vs. Lightning Lacey in their first ever, “televised” wrestling match. I think it was a tie! Sandy bought some bubbles to amuse the dogs. Some of them love to chase them, others are fascinated and just like to watch them and others completely ignore them. Tundra was particularly fascinated – in the picture on the side bar she is just standing there watching them float over her head. Ruby never lets her small size stop her!